6 x or G# 4th fretfr. optionalopt. 5 C# 1 4th fretfr. 4 G# 3 6th fretfr. 3 C# 4 6th fretfr. 2 E 2 5th fretfr. 1 G# 1 4th fretfr. 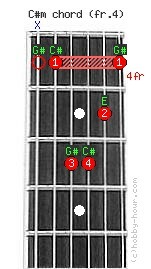 Chord C#m (4th fret) notes: (G#), C#, G#, C#, E and G#. This chord is played by placing a barre on fret four with your index finger. The note G# on the sixth string is not required, but can be played on the 4th fret if needed. C#min, C#-, (Do diez minor, C# moll).